for $1,499,000 with 4 bedrooms and 4 full baths, 1 half bath. 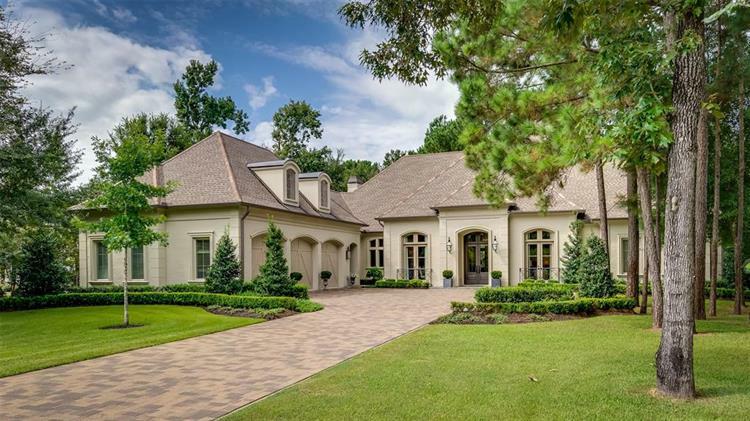 This 5,004 square foot home was built in 2014 on a lot size of 43750 Sqft..
Sophisticated and comfortable, this property showcases landscaped gardens on an acre lot backing to the Woodforest Golf Club's #3 green & 4th tee box! This custom French home is designed by renowned New Orleans architect James Chauvin. Bevelo gas lanterns welcome all inside where soaring ceilings are complemented by white oak floors, custom hand-carved limestone fireplaces in living & keeping rooms & eye-catching Visual Comfort lighting throughout. Kitchen boasts custom cabinetry, Thermador appliances & Carrara marble counters. Spacious master suite & bath. Upstairs game/media room w/dry bar & beverage cooler; 2nd office & full bath! Outdoor entertaining highlights an expansive Louisiana-style porch w/grand columns, Pennsylvania bluestone flooring & wood burning fireplace, a true retreat for all to enjoy sunset views over the golf course. Amazing garage w/insulated doors, 5 huge storage closets. A classic, modern & fresh style home featuring fine materials & designer touches.